The Marinater and I had to do something to put the memory of the over-priced and bland Patrick's Roadhouse behind us. Since The Marinater was already forging checks and prescriptions at the nearby CVS Pharmacy, it was a breeze to make our way across the lot to the nearby hamburger stand. I just had to set a dumpster on fire to distract the security team that was closing in on our boy...no big deal. 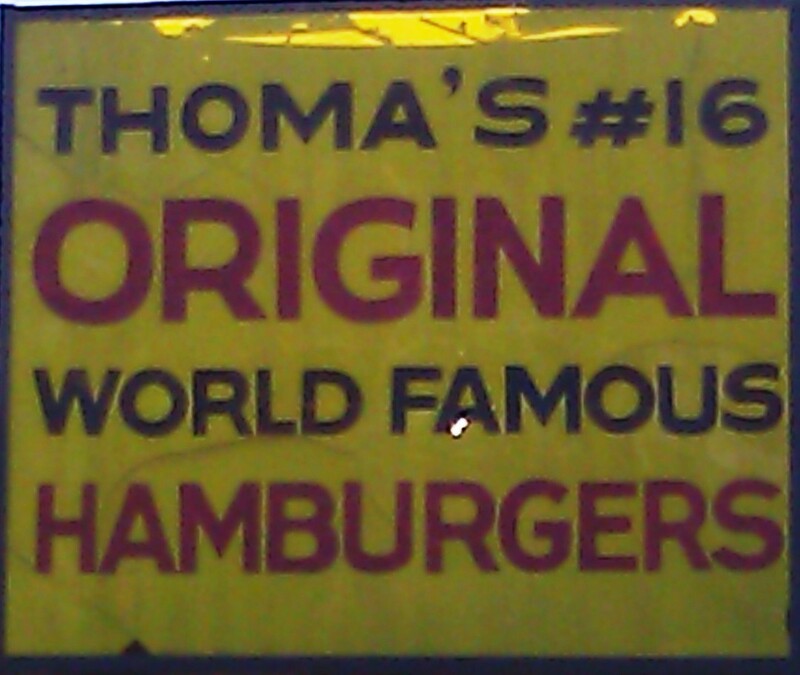 Thoma's #16 Original World Famous Hamburgers was a classic LA burger stand but with added benefit of indoor seating and some really shopworn video gaming machines. We ordered a couple of combos...double cheeseburgers, fries, and drinks with a side of chili....all for about 16 bucks. Our meals were ready in about 5 minutes. During our wait we enjoyed the familiar sounds of Star Wars "blasters." 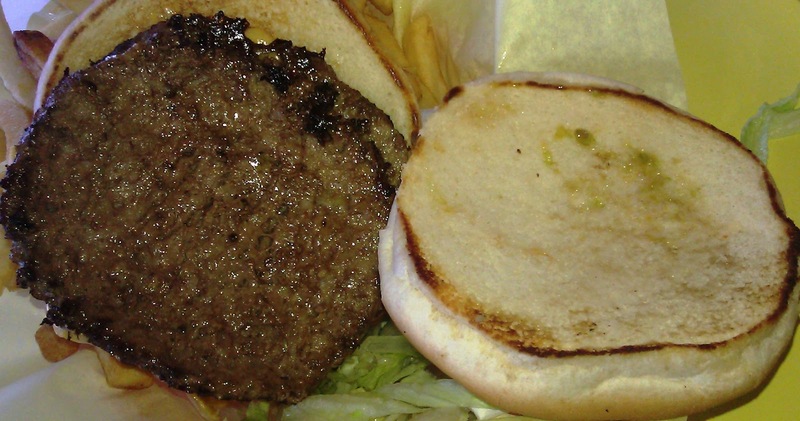 The Beef: Thoma's created their cheeseburgers from razor-thin, 1/4 pound patties. The wispy burger patties bowed into lenses as they cooked. The beef was moderately beefy. The patties were standard, food-service, previously-frozen, 80/20 Chuck. The burgers were moderately beefy. The texture of the medium grind patties was a little chewy. The beef was not especially juicy, but it was also not greasy. The beef was average. The Sear: Thoma's only seared one side of the thin, burger patties. The cheese side caught an adequate sear, but the cheese saturated the sear. That cancelled out the crispness. The Preparation: The cheeseburgers were quickly cooked to Well-Done. The patties were cooked on a properly hot griddle. These were clearly, pre-formed. The burgers were both served upside down. The Cheese: Two slices of American Cheese was better than one. The Double Cheeseburger at Thoma's came with two slices of cheese, and this was what tied the dish together. The cheese was nicely melted. This created an appropriately creamy texture. Since the patties were thin, the cheese really worked its way throughout the bite. The Bun: This was a standard, moist, fresh, non-seeded, mildly toasted, slightly sweet, and slightly yeasty hamburger bun. The bun was fine. The Meat To Bun Ratio: This was perfect in the case of the double cheeseburger. A single would have resulted in a bun-heavy dish. The Toppings: The shredded Iceberg Lettuce was fresh and sweet. The tomato slices were perfectly ripe. 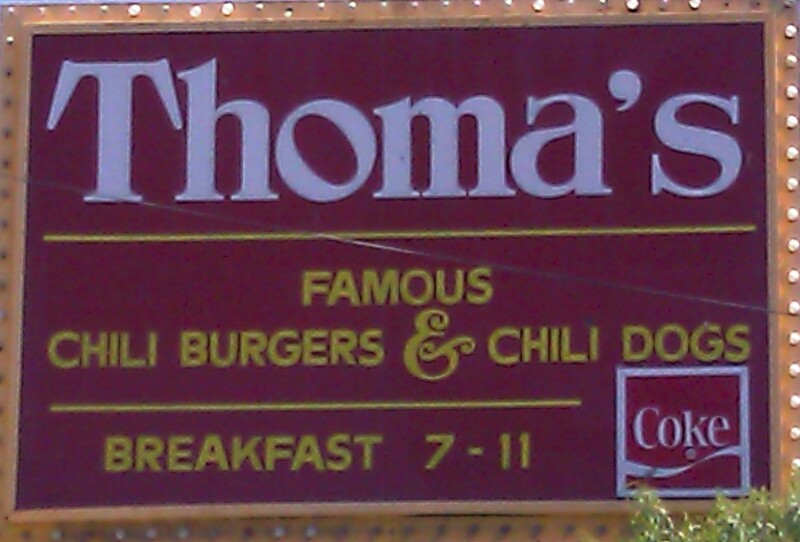 The Chili: There was something guiltily satisfying about the creamy chili at Thoma's. It was greasy, meaty, savory, rich, and altogether addictive. I applied it to the second half of my burger and my fries. The Marinater looked on in disgust. The Fries: The fries were just fine. These were pre-cut, par-cooked, frozen, and bagged fries. The staff at Thoma's fried them up, competently, in hot oil. The fries were crisp and golden. The Value: $6.99 for a double cheeseburger, fries, and a drink. The value was solid at Thoma's. This was an average burger for a really good price. We had sampled far more expensive burgers that were far less delicious. 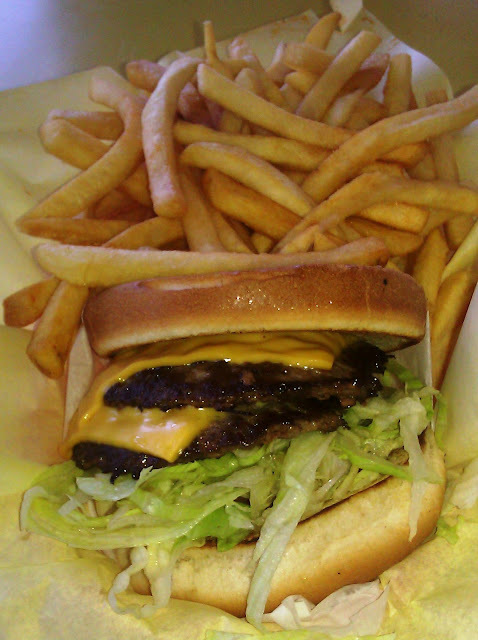 The double cheeseburger at Thoma's was nothing to write home about, but it checked all of the boxes. The burger was satisfying but not exceptional. 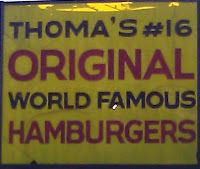 Burger Review : An average burger, but a superlative value was had at Thoma's #16 Original World Famous Hamburgers. Still, this average burger was superior to the Patrick's Roadhouse burgers in terms of quality, preparation, and value.